Preheat oven to 350 degrees. Prepare cupcake pan(s) with paper liners. In a mixing bowl, cream the sugar and butter, mix until light and fluffy. Add the eggs 1 at a time and mix well after each addition. Mix cocoa and food colorings together to form a paste, and then add to sugar mixture; mix well. Sift together flour and salt. Add flour mixture to the creamed mixture alternately with buttermilk. Blend in vanilla. In a small bowl, combine baking soda and vinegar and add to mixture. Pour batter into cupcake papers. Bake for 25-30 minutes, or until a toothpick inserted into the center comes out clean. Remove from oven and cool completely before frosting. For the cream cheese frosting, I used my old standby recipe. Blend cream cheese, butter, and almond extract. Mix in powdered sugar. Spread or pipe onto cooled cupcakes. I love your new look!!!! OMG Shannon! I am LOVING your new blog design! Super cute!! These are fantastic! I'm throwing a cookie monster/elmo party for my Son's 2nd b-day and I am going to have to make these for it! I think the Almond Cream Cheese icing is a great addition to these cupcakes. I was just going to use the basic cream cheese frosting. I am making these this weekend and I just know they are going to be great! Thanks for posting. Can you tell me how many cupcakes this recipe makes? And will that be the same for the mint oreo cupcake recipe on your site? I'm making these for a wedding shower since her colors are blue and green. :) Thanks! If I can remember correctly, both recipes made at least 24 cupcakes each. Thanks for asking! I really need to include that in my posts. Noted! Found these on Pintrest, they are fantastic! With the trend in "Gender Reveal" cakes I've been looking for a geat Boy cake. This definately fits the bill. these scream SMURFS..so I'm going to make for my kids thanks so much! Mine didn't turn out blue at all - I followed the directions and it's baby poop green! How much powder sugar is in 1 box? I've never purchased a box before, only bags. a box is typical 16 oz whereas a bag is higher. Yay. I love the color. I'm making these for the 4th of July and then again for tailgates for Auburn games. Perfect color blue. Would this work for a cake as well? Thank you so very much for the recipe, I will try in a couple of day but do you have any special instructions for the color as I tried several other recipes and it tends to turn out green blue. Hi Shannon-thanks for posting! I am going to try these soon. One question, though: how much powdered sugar did you use for the almond cream cheese? Like Jen, I purchase bags. For the powdered sugar, I think one box is usually 4 cups. I am in Australia, ul be pleased to know I made these for my grandsons baby shower this weekend. Although my blue isn't as intense as yours, it is definitely a dark blue and delicious. Thanks for sharing. I look forward to keeping an eye on what's popping up in Family Bites. 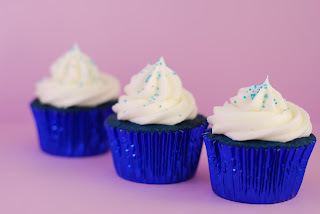 Going to try these soon..Neither of my grown grandchildren..13 n 15 will eat Red Velvet Cake ...but the love anything BLUE...its their favorite color..Can't wait to try themin other colors also !! Going to try these for this Saturday. It's my daughter's birthday and she plays club soccer. Wants to take cupcakes for after the game. 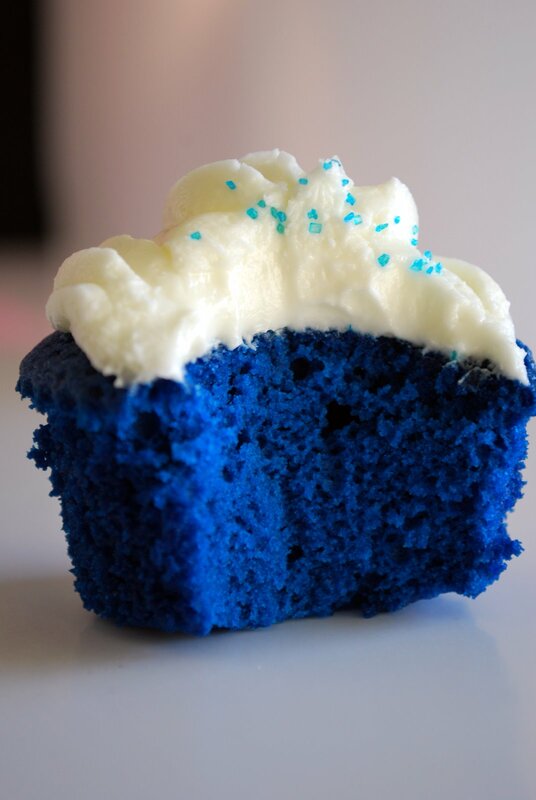 This blue is the color of their uniforms so we thought that would make for cute cupcakes! I am going to try these in orange. My daughter is graduating from highschool, and her school colors are navy, orange and white. Can't wait to see how they turn out. Mixing the cocoa powder and food coloring separately is absolutely ridiculous and unneeded. It wastes food coloring and cocoa powder and makes a complete mess. Skip that step. I just finished making these....after dealing with the ridiculous baking steps...I had to modify the recipe so much just to make them edible. I bet I added 1/4 C more cocoa and 2 tbsp vanilla. Also...not enough icing. Extremely small about for how many cupcakes this makes. I'm sorry I even tried this. I should have just added blue food coloring to Paula Deen's recipe. These are atrocious. I made these last night and it was quite a task. Lots of tedious steps and makes a lot of dirty dishes. I have a very small kitchen so this was a challenge. My friend made these before I did and they had a weird after taste. Probably from all the food gel coloring. So I added 2 T of cocoa and just eyeballed the vanilla and then they came out just fine. I'd also like to warn people to wear disposable gloves when making this. My fingers were blue for a day! lol. I also lined my counter top with parchment paper for easy clean up because that blue dough splatters a bit. I made these,but was a little worried about some of these comments posted here, so I did tweak the recipe slightly. I did 2 T of the cocoa, and just about a whole tablespoon of vanilla. I also simplified by adding the cocoa to the dry mixture, and the food color to the wet. I put the milk, vinegar and baking soda all together in my small liquid measuring cup, and then added as directed. They came out PERFECT! So thank you Shannon! I made this x2. The second time I made half the batter and added half the amount of dye. We 1st through this cupcake tasted bad due to too much dye, so we tried it again. its not the dye its the batter. This batter is HORRIABLE! looks nice, But taste is HORRIABLE! I just made this as a cake. I agree with others that it was tedious. I wish I would have read the comments before making it, I would have added more cocoa powder. I thought the batter tasted different, but hoped it would taste better after baking, no such luck. It isn't horrible, but not what I hoped such a labor would produce. At first I thought it was because the buttermilk, and we aren't use to it, but now I don't know. My color came out darker than the picture, but still pretty. Thank you. I want to try this recipe but pls explain what is 1 T cocoa powder. Is 1T equal to one tube? 1 T. means 1 tablespoon. Das Rezept ist genial und die Cupcakes schmecken super gut. Muss man einfach mal selbst ausprobieren. These were really good. I just made the cake I didnt use the icing recipe here. I didnt have to use a whole tablesppon of the blue to get them blue. I just used one of the sample sized containers of wilton dye. they were plenty blue. I am going to make them for my sons christening. You have to use gel not the liquid coloring. Michaels carries gel icing color. Works great and I'd a deep blue! You have to use gel food coloring and to get the royal blue, you absolutely have to add a small amount of violet. The cocoa powder + food coloring step is essential in order to keep the texture (i.e. velvet) of the creamed egg mixture (and thus the finished cupcake). I can't stand the pretentiousness of some people. I added 1tsp cinnamon in with the cocoa step but otherwise followed the directions exactly and had absolutely beautiful and delicious cupcakes. Thank you for the wonderful recipe. I just made me these cupcakes for my daughters graduation and they were FANTASTIC! I followed the recipe exactly and they turned looking just like the picture and they taste wonderful. Very pleased, highly recommend! YAY!!! So happy to hear that! And congrats to your daughter! Hi Shannon, when you say 2 sticks of butter, does that mean 2 whole butters? And what about 1/2 butter sticks? Hey! You will need to use 2 sticks of butter, or 16 tablespoons, or 1/2 lb. If you only the have the new half sticks that is made by land o' lakes, then you will then need a total of 4. I am unsure why you add the vinegar when you are using buttermilk. Was this so that you could use whole milk and add the vinegar in to make buttermilk? I just don't want them to be bitter. I plan on using this recipe for a baby shower this weekend. I think the vinegar is in the recipe to aid in the leavening process for the cake, not to produce buttermilk. Most velvet cakes use vinegar and should not produce a bitter taste.